Guitarists are hard on the folks in the guitar industry. 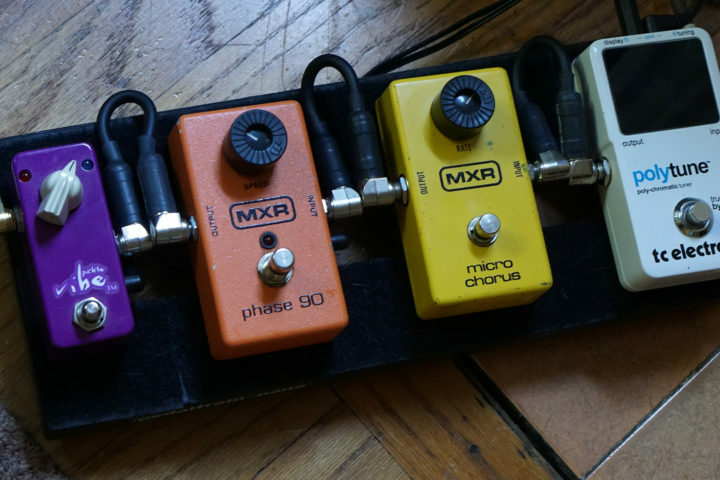 So many of our tendencies pull in opposite directions, our preferences often at odds with our needs as our love of vintage instruments butts heads with our lust for the cutting edge, giving rise to an era of ‟modern relics,” all buckle rash and compensated saddles, aged tone and hum-canceling P-90s. This stretches all the way from strap buttons to strings, though if there’s a market for relic’d strings we’ve yet to notice. There is, however, a market for ‟old school” strings. You’ve probably heard the buzz (no pun intended) around Guadalupe Custom Strings, on the Fretboard Journal’s podcast (#85) with Guadalupe’s Gabriel Tenorio, if not from your fellow players. Guadalupe is a small operation down in Boyle Heights, California, making a dizzying array of instrument strings, ranging from bajo sexto to ukulele, arpa (harp) to electric bass. 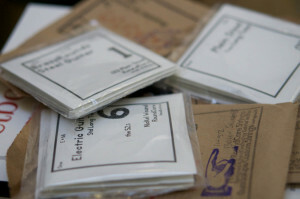 Recently Gabriel created a new division within Guadalupe Custom Strings focused exclusively on electric and acoustic guitar strings – the Gabriel Tenorio String Company. The strings are unchanged, so our Hands On look at a handful of Guadalupe strings we recently put through their paces shouldn’t be affected by this organizational adjustment. 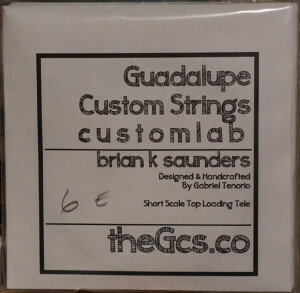 Guadalupe offers a number of ‟off-the-rack” configurations for their strings, but they also do a brisk business in custom strings for particular gauges or lengths. That said, they’re busy enough that even the standard sets are made to order, by hand. 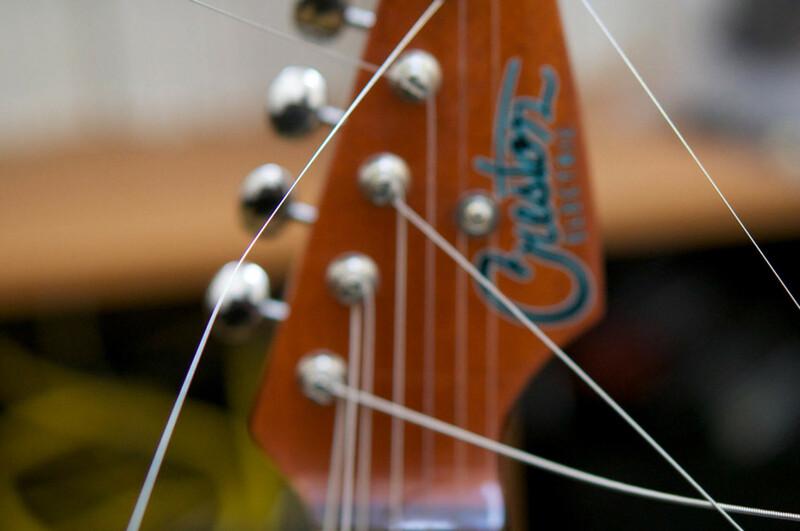 Their electric strings are nickeled steel over a round steel core. 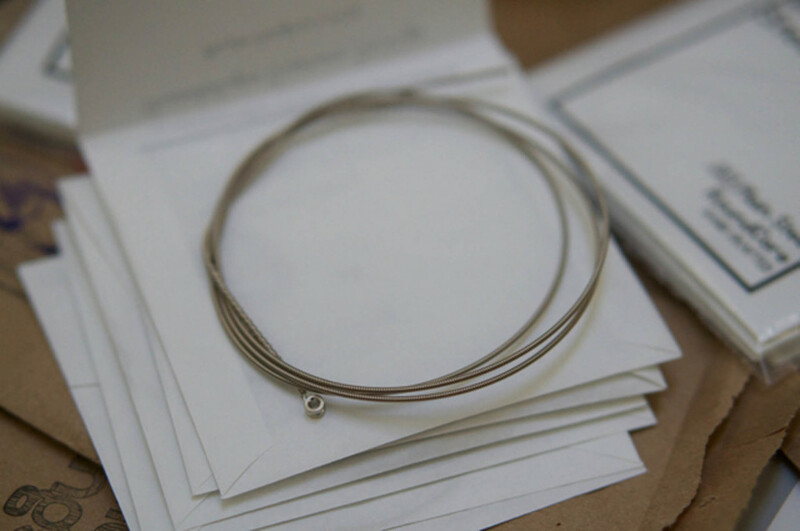 Their acoustic strings are available with either brass or phosphor bronze wraps, also over a round steel core. We got our hands on a few standard sets for electric and acoustic guitar and two custom sets – one heavy electric set for a short scale top-loading Tele and one extra-long brass acoustic set for an archtop with an extraordinarily short tailpiece. The online ordering process itself, actually, warrants a mention. 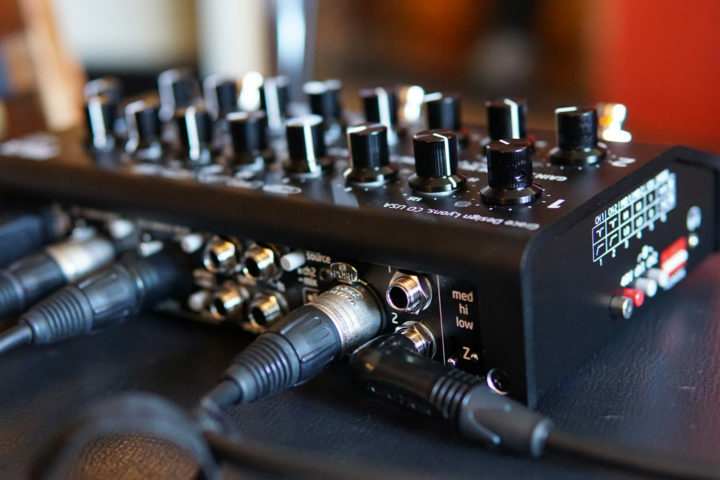 After you choose your instrument you need to specify different parameters for your order. 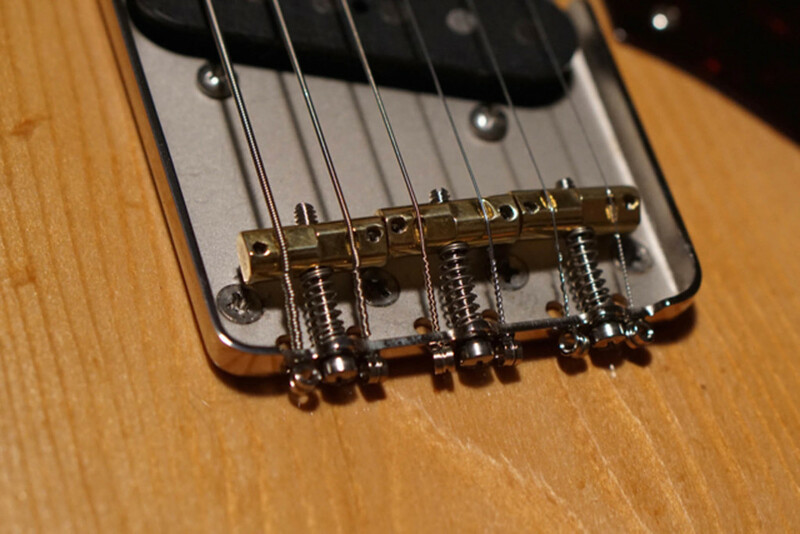 For electric guitars you select gauge, scale length and bridge type from drop-down menus. 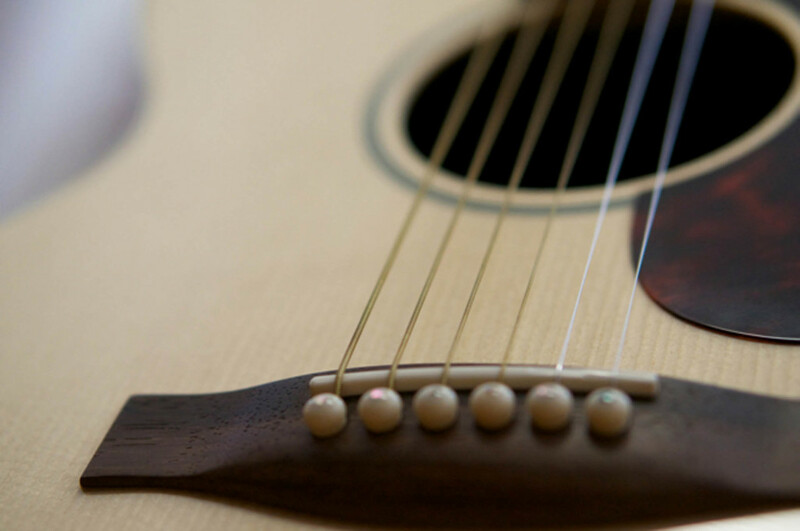 For acoustic guitars, metal type (phosphor bronze or brass), gauge and bridge type (fixed or tailpiece). If you don’t see what you need, you can place a custom order via e-mail. Aside from the thrill of custom ordering strings, you also get a nice little ego boost from getting a set of strings with your name printed on the packaging. Once you’ve got your strings the fun begins. 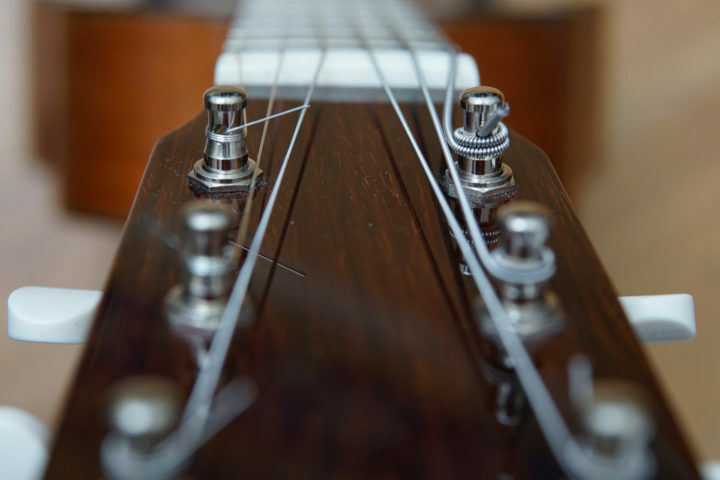 First off, it’s important to remember that round core strings should not be trimmed until they’ve been tuned to pitch (Guadalupe recommends three full turns ‛round the tuning post, though Gabriel says they have a few tricks that can help if you absolutely must pre-trim, e.g. if you have center-post Kluson-style tuners). Beyond that the strings go on easily enough. Those extra few steps you took when you ordered finally make sense when you see the fit of the strings and the difference in the finish wraps – the extra short wraps for your top-loading Tele that stop well short of the saddle, the extended wraps on the archtop. Both the electric and acoustic sets need minimal stretching after being tuned to pitch, holding steady with the merest bit of breaking in. Tone-wise, both the acoustic and electric sets are clear and balanced. The brass strings are warmer than most acoustic strings, be they phosphor bronze or an 80/20 alloy, but they still ring loud and true. They have a handcrafted, ‟artisanal” feel about them, not quite rustic but neither quite as polished as, for example, a set of Thomastiks. After testing some of the tension/torque-centric designs that have passed through our hands recently these strings were an interesting counterpoint, providing an almost visceral experience that invited lingering as much as digging in. These brass strings were equally happy on a flattop and an archtop, and the extra long set easily accommodated the unusual dimensions (Thomastik strings, for example, end up with their silk wraps starting about 3/4″ before they reach the nut of this particular guitar) and providing a strong, buttery tone with a well-rounded low end to this small-bodied guitar that tends mid-heavy. That experience holds true for the electric strings, as well; though the tone of the strings tends less toward ‟warm” there’s still an abiding richness, a sweetness that makes it hard to stop playing – always the case with a set of fresh strings, but usually the bloom is off the rose sooner. The heavy (12-54), short scale set gave the Tele a fuller, rounder tone without losing any of the ‟woodiness” that characterizes this particular guitar. The off-the-rack, top-loading Tele set (11-52) went on a Parsons B-Bender equipped Tele and had all the snap, twang and pop you could ever want, but still had the richness that is starting to look like a Guadalupe hallmark. The bender mechanism itself needed a little tweak to bring the sweep back to a full step, but otherwise the transition from the D’Addario EXL 116s we replaced was seamless.